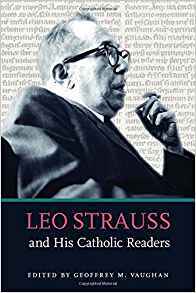 Leo Strauss and His Catholic Readers. Geoffrey M. Vaughan, ed. Catholic University of America Press, 2018. This is a most welcome, often profound inquiry into the relation between Catholic scholars of political philosophy and Leo Strauss who is among the most influential political philosophers in the twentieth century. Strauss is well-known for arguing that it is the tension between reason and revelation — between philosophy and faith — that fosters the dynamism of the Western tradition. He respectfully but insistently challenged the Christian effort to reconcile this tension as found preeminently in Saint Thomas Aquinas and the Thomistic tradition. On the other hand, Catholic thinkers are often allied with the followers of Strauss in their critique of the “crisis of the West.” Catholics and Straussians join in responding to the challenge of historicism which denies objective values or eternal truths, agreeing on the task of questioning historicism’s dominance in our intellectual and academic life. But Strauss also had insisted that one must choose between the philosophic life and the life of faith – that trying to combine these is ultimately an untenable compromise of both. Thus, while there are those who may describe themselves as “Catholic Straussians,” the question arises whether this is a coherent philosophical position or is a tactical but uneasy alliance. The contributors to this volume explore this question with care and in detail. The strength of their analyses lies in the fact that they are deeply versed in the Catholic tradition but have also taken the trouble to explore Strauss’s writings thoroughly, carefully and sympathetically. Readers of this book will gain much insight into both poles of this charged field of inquiry. Part I contains five essays centering on the question of Natural Right. The first of these, by Robert Kraynak, is especially useful. Its comprehensiveness serves as a guide to the issues addressed by the other authors in the book. He rightly identifies the core of Strauss’s achievement which was to think “through the entire Western canon of philosophy and theology without any preconceived assumptions about the superiority of modern thought” (44-5). But this also led Strauss to challenge the synthesizing tendencies of Catholic thinkers insofar as they seek to harmonize tensions in thought between “ancients” and “moderns,” and between those committed to philosophy as inquiry through human reason alone and those committed to reason informed by revelation. The gist of Kraynak’s response is that Strauss overplays these oppositions perhaps because he was responding to the modern Hegelian version of reconciling all oppositions which leads to the Nietzschean critique of all such efforts as intellectually dishonest. That Nietzschean critique is in the background of Strauss’s critique – acknowledging the force of Nietzsche’s diagnosis while rejecting his “remedy.” In other words, historicism’s dominance challenges one to decide where one stands. To this extent Kraynak is grateful to Strauss since his challenge to the Catholic tradition is a catalyst for reinvigorating Catholic thought through an honest confrontation with the issues. Kraynak calls himself a faith-based Straussian. One does wonder, however, if what he really means to say is that Strauss has forced him to become a better Catholic thinker, still seeking harmonization of reason and revelation. Not quite the same thing. Bradley Lewis’s reflection on Charles McCoy is of interest among other reasons because the essays McCoy wrote on Augustine and Aquinas for the first edition of the Strauss-Cropsey history of political philosophy were subsequently replaced with essays by Ernest Fortin. Fortin was more “Straussian” than McCoy. Lewis’s essay is primarily an exposition of McCoy’s political philosophy which was strictly Aristotelian-Thomistic. McCoy thought Strauss did not interpret Aristotle correctly. Specifically, McCoy found Aristotle to be a theological thinker which Strauss rejected. According to McCoy, Strauss attempted “to avoid the theological implications in Aristotle’s view, implications only fully developed by Aquinas” (68-9). In Strauss’s terms the theological interpretation means thinking along developmental lines, or an unfolding of thought which advances beyond the ancients. This, for Strauss, promotes the historical point of view, opening the way to reducing the “rational” to the “real,” the step taken post-Aquinas who still held to a version of “natural right.” McCoy agreed with Strauss in opposing the modern development. However, in Strauss’s view the aim to integrate reason and revelation is a step toward the modern historicist crisis. Lewis concludes forthrightly: “If one is a Christian, one cannot be a philosopher in the sense that Plato and Aristotle were philosophers…if the Gospel is true, the world is different, and one cannot act as if it is not” (76). Strictly speaking, then, one can gain a great deal from studying Strauss’s work, and indeed be grateful for Strauss’s achievement, but one cannot be both Catholic and Straussian. Geoffrey Vaughan explains Strauss’s critique of modern adherents of Thomistic natural law theory. According to Strauss, Saint Thomas’s account of Natural Right assimilated it to a law-like, potentially dogmatic project which excited the modern reaction against it. The Platonic-Aristotelian accounts of Natural Right allowed for prudential judgment according to circumstances rather than appealing to an “absolute standard of right” (92-3). To the extent that such an “absolute standard” got translated into a project for historically progressive improvement of regimes – rival projects as to what policies might fulfill or approximate the absolute standard – Strauss opposed the natural law version of natural right thus understood, preferring the Aristotelian understanding. Vaughan concludes that anyone wishing to recover a Catholic political philosophy would need to understand this critique and address it. Whether the “new” natural law theories of such thinkers as Maritain, Grisez or Finnis meet this challenge is a matter for further inquiry. Marc Guerra offers a comparison of Strauss and Pope Benedict XVI in terms of their respective efforts to “unearth the nature of the West” as they both respond to the “crisis of the West” (95). Strauss thought that “modernity” sought and seeks liberation from both Athens and Jerusalem. Guerra provides a useful summary of Strauss’s account of this movement from Machiavelli to Rousseau to Nietzsche. He shows that Strauss launched an intellectually powerful opposition to what has become customary treatment of this movement as an insurmountable historical development from a lesser to a profounder understanding of the human condition. Pope Benedict’s account of the break with the pre-modern bears similarities to Strauss’s. Yet there is a profound difference: Strauss “subtly implicates Catholic Christianity in the founding of modernity, [but] Benedict depicts modernity as a falling away from Catholicism’s unique mediation of the classical Greek, Roman and biblical elements in the West” (102). Guerra follows with a useful summation of Benedict’s elaboration of this point. Guerra also provides an illuminating discussion of the question whether the universe is God’s creation or an eternal “nature.” He makes the important point that Catholic thought cannot be adequately understood in terms of the ancient/modern dichotomy and thus eludes the either/or choice that Strauss encouraged, even though Strauss very well understood that the choice itself requires profound reflection. Douglas Kries offers a striking analysis of Ernest Fortin, the “Straussian theologian.” But he begins with an exposition of Strauss’s early formation as a Jewish student within, and ultimately critic of, the Enlightenment, which led to his exploration of the origins of the Enlightenment through exposition of Hobbes, Spinoza, and Machiavelli — the progenitors of modern liberalism. Kries starts this way in order to explain what led Father Fortin, as priest and scholar, to associate himself with Strauss from the 1950s forward. Strauss had become a severe critic of the Enlightenment especially concerned for the situation of Jews in Weimar Germany. Fortin had met Allan Bloom in Paris where they were both studying. Bloom introduced Fortin to writings of Strauss which, Fortin realized, offered insights into the Western tradition which he had not gained from the famous professors with whom he was then studying, specifically the significance of the modern doctrine of “natural rights” superseding the classic “natural right.” He began to write on modernity with attention to Hobbes under the inspiration of Strauss’s work. Kries summarizes the consequence: Fortin was concerned “to engage a number of medievalist scholars, especially Catholic ones, who were arguing and had been arguing for some decades that the transition from the natural law of Thomas Aquinas and his followers to modern natural rights or human rights was one of continuity rather than discontinuity . . . an unfortunate confusion that had established itself within Catholic thinking about morality and about politics” (127-8). This led to a critique of the “new natural law” theorists. Fortin’s critique of Catholic social teaching leads to Kries’s most striking comment: Fortin sought “to bring Natural Right and History to bear on the thought behind Rerum Novarum” (130). Briefly, Fortin criticizes Rerum Novarum for trying to synthesize antithetical positions — the Aristotelian/Medieval and the legacy of Locke. A reader might be left with this question: Insofar as Leo XIII, in the wake of the controversies surrounding Pius IX and the intense hostility to the Church since the French Revolution, was seeking in Rerum Novarum to engage modernity rather than simply reject it (which could mean further isolation in a hostile world), and insofar as Saint John Paul II in Centessimus Annus was reflecting the Second Vatican Council’s goal to work with the world rather than withdraw from it, perhaps the Church was showing more openness to prudential judgment of the sort Strauss commended. A risky strategy to be sure, but responsive to a world in which there is unavoidable risk. There follow nine essays which explore further to what degree, from a Catholic point of view, there could be integration of Strauss’s thought with Catholic teaching, coupled with analysis of Strauss’s rejection of that possibility. Gladden Pappin compares A. P. d’Entreves, Charles McCoy and Yves Simon to Strauss to show how their response to the challenge modern science poses to philosophy differs from Strauss’s. The contention is that Strauss focused on the effect on the philosopher while the others focused on the impact on ordinary life (139). Nevertheless, in defending the natural law tradition, attention is paid to a natural desire in human beings for order which appears independently of force. This natural understanding resists the value-neutral stance of the modern scientific outlook. The natural lawyers share with Strauss that opinion expressed among citizens is the natural ground of political reflection. These authors resisted, along with Strauss, the transformation of thinking about moral virtue – “stripped of its old grounding and context” (166) wrought by Machiavelli and modern science. John Hittinger continues this theme showing that Thomists and Strauss can jointly recover a deeper understanding of Aristotle. Even if Strauss and Catholic thinkers diverge, the recovery of Aristotle, along the lines proposed by Strauss for reading the ancient philosophers as they understood themselves, deepens Catholic thought in its effort to “defend human freedom and dignity with both faith and reason” (189). Continuing this theme, Carson Holloway examines Strauss’s argument in “Progress or Return?” that integration of philosophy and revelation is impossible. Perhaps, however, Strauss constructed pure ideal types of philosophy and revelation such as to define their incompatibility from the start. This suggests a further project to test Strauss’s readings of the ancients to see if he actually understood them as they wished to be understood. Gary Glenn suggests that Catholic thinkers have a greater desire for reconciliation than does Strauss despite their common critique of the crisis of the West. This is reasonable considering that the Catholic tradition is naturally disposed to such reconciliation. That Strauss is skeptical in part is explained by his contention that reconciliation efforts pave the way for modern historicism even if that is an unintended consequence of the Catholic tradition. However, to insist on Aristotle independent of the Catholic adoption of Aristotle is to accept the moral limits of “reason alone” (as, for example, condoning “infanticide”) which, for Catholics, shows that reason alone portends a deeper insight needed to complete moral understanding. Brian Benestad exposes the issue very directly by addressing the emergence in the Church of “revisionist theology” which marks historicism’s invasion into the Church’s intellectual life. Strauss is thus a great friend to the Church for having identified historicism as fundamental to the modern crisis with a depth of analysis not found in modern theologians. That Strauss did not accept the integration of reason and revelation is far less important in the present crisis than his identification of the crisis for both philosophers and those of faith. Giulio De Ligio explores this intellectual terrain settling on “mediation” rather than integration or synthesis. This suggests a continued dialogue to reinforce the common effort to diminish the crisis we all must face. James Stoner also summarizes the issue which runs through all the commentaries of this volume: “In developing a doctrine of natural law which takes precedence over natural right, Strauss charges, Aquinas seeks to synthesize what cannot be synthesized” (287). But is this the right way to characterize Aquinas’s thought? Perhaps Aquinas was expounding not a synthesis but a fundamental unity which humanly we respond to as dichotomous seeking to recover its primordial unity. If, as Stoner argues, Strauss was committed to classical metaphysics, despite the passages where he speaks of the modern scientific refutation of classic metaphysics, then perhaps Strauss was aware that reason points to something transcendent. Philippe Beneton, speaking of Pascal and Strauss, takes his turn assessing the plausibility of dialogue between Strauss and Catholic thinkers. He reminds us of Strauss’s remark that refutations of revelation presupposes unbelief in revelation; refutations of philosophy presuppose faith in revelation. Referring to another theme running throughout these essays, we may observe that the refutation of historicism presupposes unbelief in historicism; refutation of classical philosophy presupposes unbelief in classical philosophy. Beneton thinks this position can be questioned. Pascal and Strauss do have one thing in common, namely profound awareness of the “limits of human reason or the natural uncertainty concerning the first things” (291). He points out that for Strauss Jews are to be obedient to the law without qualification (as also for Muslims), instantiating the true man of faith. Christians have always brought reason into their faith. But is such loving obedience really the abandonment of reason? Pascal was clearly a man of reason and also of resolute faith implying obedience. Beneton concludes that Strauss nobly tried to preserve “meaning of life in the absence of God…also to preserve the old morality” (298). But Nietzsche insisted “it is impossible to preserve biblical morality while abandoning biblical faith…Nietzsche was right” (298). Could it be that restoring the significance of Greek philosophy actually prepares the way for recovering the fulfillment of that philosophy in the Christian understanding? Finally, Ralph Hancock, reviews several recent interpreters of the origins of modern liberalism (Siedentop, Badiou and Kojève) which find the modern situation (whether crisis or achievement) to be an outcome of the Christian legacy. This leads him to the following conclusion: “Strauss does not publicize the affinities or parallels between the Christian and modern syntheses, because he values a practical alliance with Christian natural law…he remains an indispensable thinker for believers because of his unrivaled deconstruction of the faith [progressivism/rationalism] of modernity…Christians can appreciate the force of Strauss’s very discreet argument that Christianity is vulnerable to co-optation by ‘social justice’…” (321). Somehow Christian love of neighbor must be complemented by the sober reflectiveness, even severity, of the classics. There is no simple formula for attaining this resolution. Perhaps it demands a return to pagan philosophy or to the strictness of Judaic law. Perhaps not. We cannot hide from this predicament – it seeks us out. After all this learned commentary is said and done, it is hard to avoid the thought that “Catholic Straussian” describes an aspiration which, as Strauss might say, would require philosophy to be put in the care of the Church. Timothy Fuller is a Professor of Political Science at Colorado College. He has written several forwards in the works of Michael Oakeshott. Hugo Grotius on Human Rights: A New Avenue for Rethinking Today’s Politics?